News reports have been popping out these past couple of weeks about a new Sidekick heading to the T-mobile line-up. Well now pictures are popping up to go along with the news reports. 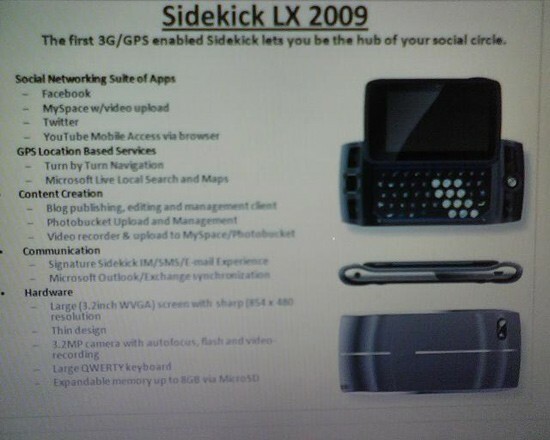 What you’re looking at is what seems to be called the Sidekick LX 2009. Finally for once, this Sidekick might not be outdated from every other PDA out. The picture was spotted by a reader over at Hiptop3 who came across the image while taking an online survey. Of course specs have not been confirmed yet but according to the image, the phone boasts a 3.2-inch WVGA display (854 x 480), a 3.2 megapixel camera, microSD card slot, easy access to YouTube, MySpace and Twitter, turn-by-turn navigation and video recording capabilities. Could this really be it? Drop your thoughts in the comments.